[Europe personified as a woman.] - MÜNSTER, S.
Title : [Europe personified as a woman.]. Size : 10.2 x 6.5 inches. / 25.9 x 16.4 cm. 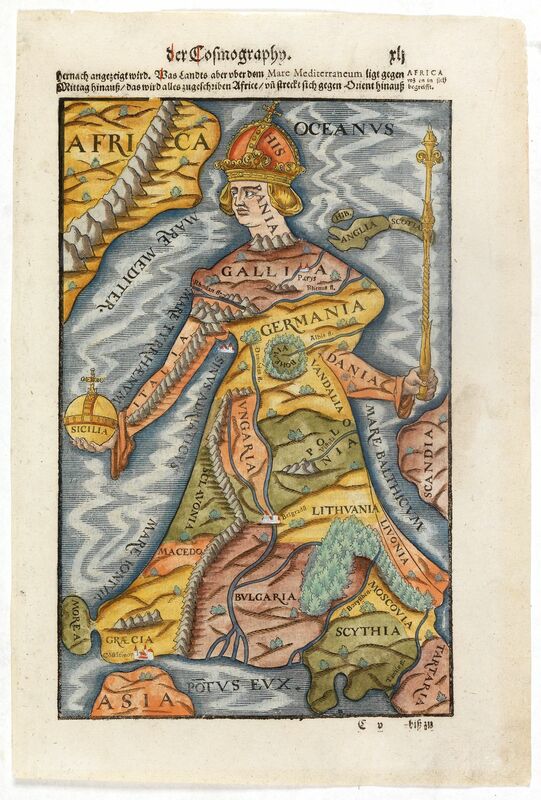 Description :Among the most striking of early cartographic curiosities is this woodcut of Europe regina or Queen of the world. This is a simplified version of Johannes Bucius' representation. HISPANIA (Spain) is shown in the figure's crown in acknowledgement of its dominance. GALLIA (France) is the upper chest. GERMANIA is the bosom. ITALIA is Europe's right arm, with SICILIA being the globus cruciger, the cross-bearing orb signifying world power throughout the Middle Ages. DANIA (Denmark) is the left arm of Europe, holding what appears to be a ceremonial sword, another classic piece of regalia. BOHEMIA (the Czech lands) is a circular area close to Europe's stomach. VNGARIA (Hungary) and SCLAVONIA (land of the southern Slavs) are the right thigh and VANDALIA (probably a reference to the Wends, a collective name for Slavic peoples in present-day eastern Germany) and POLONIA form the left thigh of Europe. LITHVANIA must be about the spot of Europe's left knee. LIVONIA, MACEDONIA , BVLGARIA, MOSCOVIA, MOREA (the mediaeval name for the Peloponnese peninsula), GRAECIA, SCYTHIA (present-day Bulgaria), TARTARIA (parts of present-day Russia) are folds ever further down Europe's flowing red dress. The British Isles are shown, but not integrated into the figure. It has been argued that instead of a woman, the map represents Charles V of Spain, modeling a Europe that had Spain as its crown.